The Spine Care Center in Manassas has helped hundreds of patients manage and treat the symptoms caused by collapsed discs. If you or someone you know is suffering from a collapsed disc, then get in touch with our office to schedule an appointment. You can read more about collapsed disc causes, symptoms, and treatment options below, and you can visit this page to get started with an appointment. What Is a Collapsed Disc? The discs between your spine bones (vertebrae) help to cushion your bones and keep them spaced apart. This space allows nerves to travel from your spinal cord into the rest of your body. As you age, however, these discs can become thinner and thinner. 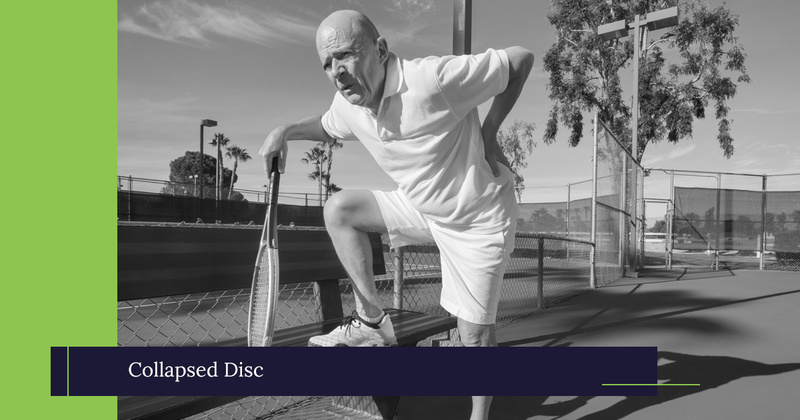 A disc that is too thin, called a collapsed disc, in turn puts pressure on nerves in the area. Without enough space between your vertebrae, the nerve is pressed on by the bones. Collapsed discs occur most commonly in the back (lumbar spine) or in the neck (cervical spine). Though they can be caused by injuries, they are more commonly caused by degenerative disc disease, a natural process of aging. A spine care expert can help you find relief from these symptoms, often without resorting to invasive surgery. You will begin by making an appointment with our spine care experts. During your appointment, your doctor will ask you a variety of questions about your pain. They will likely ask you about when it started, what makes it worse, or what makes it better. Your doctor will also perform a physical examination in order to gain a better understanding of your symptoms. They may ask you to complete a few simple motions to see how movement affects your pain. To rule out other conditions that often cause back pain, your doctor may order imaging tests like X-rays or MRIs. These tests allow your doctor to see the bones, discs, and muscles in your back and make an accurate diagnosis. The expert team at The Spine Care Center provides both surgical and nonsurgical collapsed disc treatments. You can rely on our skilled physicians to help relieve your pain. Their dedication to great patient outcomes has earned them repeated recognition as Top Doctors in both the Washingtonian and Northern Virginia Magazine. More than 90 percent of our patients don’t require spine surgery to relieve their pain. However, if your pain does not go away with treatment, our expert spine surgeon, Faisal Siddiqui, MD can help you decide if surgery is right for you. Dr. Siddiqui has performed thousands of surgical procedures throughout his career, providing long-term pain relief for his patients. Take the first step toward back pain relief. Call The Spine Care Center in Manassas or request an appointment with our spine doctors online.